A year ago, the Internet faced the biggest threat in its short lifespan, and won. It's worth recalling the story. In early fall of 2011, the recording and music industries, fed up with the number of songs and movies that were circulating for free online, approached lawmakers with a seemingly fair-minded solution: Prevent search engines, Internet service providers, payment processors, and ad networks from dealing with sites that violate copyright. Oh, and on top of that, grant law enforcement broad powers to police and punish those who fail to comply. Just a quick fix to protect struggling actors and singer-songwriters. Well, the proposal wasn't quite so wholesome: It would have required an unprecedented degree of surveillance and control over a communications medium that had come to power the American economy. Within weeks, Google had collected seven million signatures opposing the idea, Jon Stewart had announced it would “break the Internet,” and thousands of websites—including Wikipedia and Reddit—organized a coordinated blackout in protest. In early January, Politico dubbed the measures an “election liability” for backers. Faced with unexpected backlash, sponsors of the Stop Online Piracy Act and its Senate companion, the Protect Intellectual Property Act, started dropping. The bills were dead by late January, and Hill watchers agreed that something basic had changed about how legislators looked at the Internet: It was no longer a technical backwater that could be left to the lobbyists, but rather a popular issue just like guns or abortion, something that could make you an object of ridicule on right-wing talk radio and "The Colbert Report" alike. The revolt has so far forestalled similar attempts by the content industry, says Lofgren. "It's latent power," Lofgren says. "We've really never seen anything like that, in the blackout, which just completely changed the dynamic. It was unstoppable, before it became unthinkable, and that was because of the outcry. Everybody knows that could happen again, and therefore it hasn't happened again." It's true that the music and recording industries haven't come back with a similar onslaught; Motion Picture Association of America president Chris Dodd said Hollywood has gotten the message. But the ripple effects don't stop there. The copyright fight left legislators reluctant to get behind any kind of Internet legislation, for fear that they might be accused of trying to perpetrate another SOPA or PIPA on the Internet-using public. "It's sort of like a debate-ending statement. 'Reductio ad SOPA,'" says Slade Bond, a staffer for Georgia Democrat Rep. Hank Johnson, who has been tip-toeing forward with a mobile privacy bill. 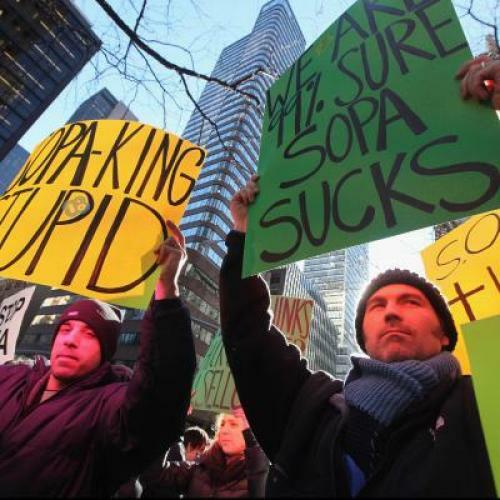 "It's simple and easy to confuse SOPA with legislating the Internet." Meanwhile, with essentially no in-house technical expertise on committee staffs or in legislative offices, Congress has no one to turn to on a day-to-day basis to learn what might tick off the Internet. "They didn't know which issues would lead to that backlash, so they were being very careful on anything that involved 1s and 0s," says the American Civil Liberties Union's Chris Soghoian, who had served as the Federal Trade Commission's first staff technologist. Rep. Darrell Issa, a strong SOPA opponent from the conservative side, has even proposed a two-year moratorium on all laws that would change the Web's underlying architecture (the bill is mostly a symbolic protest; he hasn't pushed it that hard). There's nothing wrong with lawmakers stopping to think before trying to regulate technology that's changing more quickly every day. But the danger is that some things really do need action from Congress. The 1986 law governing privacy in electronic communications desperately needs an update, for example, and the sclerotic software patent system is more of a drag on innovation every year it’s not modernized. None of those got done this year, in part because not much of anything got done this year, but also out of confusion over what the anti-SOPA masses really want. And that's because the coalition of convenience—now vaunted as a powerful new political force—can't actually agree on much else. But when other Internet-related bills came to the floor, the troops failed to coalesce. Case in point: The Cyberintelligence Sharing and Protection Act, which would have made the U.S. government privy to Internet traffic information gathered by private companies, raising the hackles of many of the same groups who'd opposed SOPA. Tiffaniy Cheng—a co-leader of the Worcester, Mass.-based Internet freedom group Fight for the Future, which had coordinated the opposition—said members of Congress came to her asking what the Internet thought. "It was definitely a different kind of fight," she says. "There was definitely an anticipation and anxiety about 'what will the Internet do,' and 'where does the Internet stand on this issue.'" This time, however, the giants of Silicon Valley came out in favor of the bill, as did Issa. It passed the House in late April before getting mired in the Senate (which Cheng counts as a victory). On another major issue to come up in 2012—online privacy regulation—the anti-SOPA coalition broke down again. Cheng's liberal cohort favors strong privacy regulations to protect Internet users from big companies like Google and Facebook. Those companies feel differently, and conservatives tend to back them up, albeit reluctantly. No wonder the power of the anti-SOPA coalition hasn't been fully realized since. Here’s a truth that’s a lot older than the Web: It's a lot harder to get good things done in politics than to stop bad things from happening. Congress and the anti-SOPA forces came together once more to oppose a United Nations body's attempt to gain greater control over Internet communications. But when it came to passing a bill that would level the playing field for Internet radio services like Pandora and Spotify, most of those players failed to materialize, and the bill's gone nowhere. In the upcoming session, Fight for the Future wants to do something proactive to solve the problem of excessive copyright protection, which even the techno-libertarian piece of the anti-SOPA coalition could get behind. But the rest of the Internet-using public? "Everybody who ever shares something, or comments on a video or anything like that, we're hoping to get those people to take action," Tiffiniy Cheng says. Lofgren, who plans to try a bill that would shorten copyright terms, doesn't sound optimistic that Cheng's forces will show up when they're needed most. "That's the problem," she says. "Those who would like to make a profit, essentially for an eternity, will be here. Those whose financial interests are not present, who just suffer from the decline in creativity in a generic sense, will not be here. And that's why the voices of freedom do not always win."